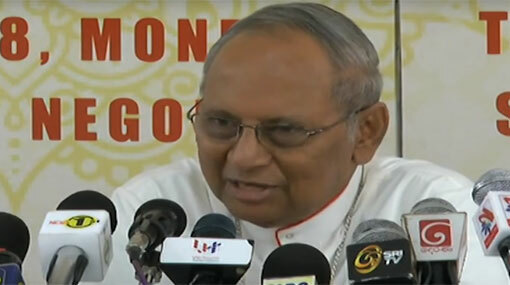 Archbishop of Colombo, Cardinal Malcolm Ranjith today urged authorities currently constructing the world’s tallest artificial Christmas tree, which they hope will break the Guinness World Record, to use that money on the country’s poor people instead. “This is an unnecessary cost. It would be better if we can build a house for a poor family using this money or give some scholarships,” he said, speaking at a press conference in Colombo. He urged those responsible to build the tree halfway if possible and use the remaining money on poor people as it would serve as a message. Once completed, the Christmas tree will stand at a height of about 114 meters and be decorated with 500,000 multi-colored lights. It will stand next to a 6-meter-tall Santa Claus and two 3-meter-tall reindeers amidst a number of Cyprus trees that will create a forest-like effect. Mexico currently holds the world record for the tallest artificial Christmas tree which topped 90 meters in 2009. Authorities from the Guinness World Records will visit the Sri Lankan site two weeks prior to its completion, presumably with a very long measuring tape.